Our local GAME store shut its doors for the last time today. This photo was taken about an hour ago, as disconsolate staff inside were shuffling about and slowly putting things in cartons. As you see, staff decorated the front window of the store with Rage Faces. 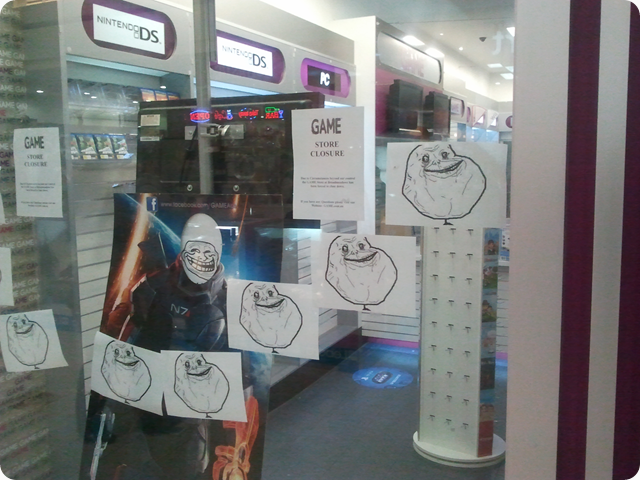 The “Troll Face” Rage Face for Commander Shepard on the Mass Effect 3 display stand, and the “Forever Alone” Rage Face plastered all over the store windows.